Republicans think Joe Biden’s admission that “the middle class that has been buried the last four years” presents an opportunity. Not if the American people are smart enough. Editor’s Note: Join Nation writers, editors and readers tonight for an online debate watch party—complete with humor, analysis and political drinking games! RSVP here. In Denver, where some members of the national media have already arrived for Wednesday night’s presidential debate, the state Republican Party quickly threw together a press conference Tuesday evening to “discuss how the middle class has been buried under President Obama.” Standing in front of a Romney/Ryan campaign bus emblazoned with the slogan “More Jobs, More Take Home Pay,” three Republican politicians gleefully recounted statistics that illustrate the financial squeeze that has been placed on many American families. Unfortunately for the Republicans, though, the arguments they presented demonstrate why Biden’s comment may not be nearly as damning as they hope. At first glance, it was incredibly foolish of Biden to admit that the last four years have been tough ones for many voters. Certainly, Biden’s statement can only do more harm than good for the Democratic ticket. But it will be seriously damaging for Obama and Biden only if voters are not smart enough to recognize an important fact of American politics: the White House does not single-handedly control all aspects of their lives. It does not hire and fire all the employees, or set all their salaries or set the prices of commodities. What Biden said is true: the middle class has had a hard few years under Obama, but Obama’s opponent would make the next four years even harder. If voters can separate those two things—to be sure, that is never a safe assumption—then Biden’s gaffe will not get much traction. “Joe Biden is the broken clock that got it right,” joked Barbara Comstock, a Virginia state delegate at the Tuesday evening press conference in Denver. 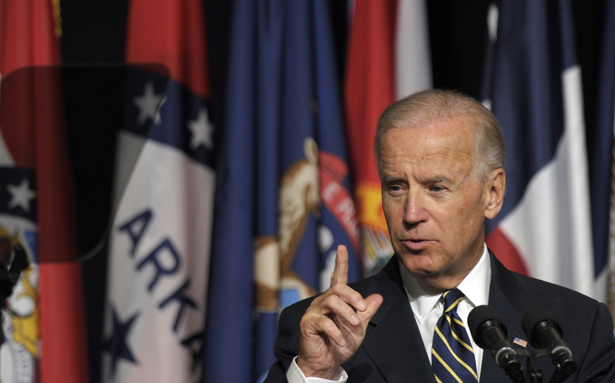 “Biden was more honest than he intended to be,” gloated former congressman Bob Beauprez. Beauprez went on to note the various measures by which the country has suffered. “There are more people unemployed than when Barack Obama stepped into the White House,” he said. Beauprez argued that the high rate of unemployment proves that the American Recovery Act was an abject failure. Beauprez threw out more statistics, always using Obama’s inauguration as the benchmark: gas prices are higher, the debt has increased, health insurance premiums have risen. This is all technically true, but wildly misleading. The economy lost 3.8 million jobs between December 2008 and April 2009. Obama took office on January 21, 2009. No reasonable person could conceivably blame Obama for those layoffs. They were the result of the recession that began on President George W. Bush’s watch. The Recovery Act passed Congress on February 13, 2009. Obviously it took several months for the money it appropriated it to be disbursed, and a few months more for the multiplier effect of increased consumer spending to further bolster employment. (The Congressional Budget Office estimated that the stimulus saved or created 1.4 million jobs directly and 3.6 million jobs if you include indirect results.) That is why, if you look at a chart of US employment from the Bureau of Labor Statistics, you will see that employment has grown consistently since Obama’s policies started to take effect. But it is also important to remember that the president does not set policy unilaterally. If Obama had his druthers, the stimulus may have been bigger and there would certainly have been further rounds of it. He was constrained by Republicans in Congress who refused to support even stimulative tax cuts. The same lesson—that the president’s influence over the economy is limited by Congress and the laws, policies and macroeconomic conditions he inherited—apply to the other metrics Republicans use to measure the difficulties of the last four years. The debt has indeed increased, but that is because of Bush’s policies—tax cuts, spending increases and wars—and the recession he left for Obama. And then there is the fact that elections are choices. Obama and Biden do not need to convince a plurality of American voters that they are economic magicians. They need only to convince them that they will do better than their opponents. So what do their opponents propose? More of the same policies which created exactly the conditions bemoaned by Biden and Republicans alike. In Denver the Republican speakers attacked the stimulus in one breath and in the next breath they promised that Romney would boost employment by cutting taxes. But the stimulus consisted largely of tax cuts. I asked, If tax cuts were just proven not to stimulate the economy, as the speakers had implicitly just asserted, then why do they say more tax cuts will create growth? Representative Cory Gardner (R-CO) seemed not to understand the question despite my offering several clarifications. He just kept repeating ad nauseam that the stimulus had been “proven” not to work because unemployment remains above 8 percent. Beauprez offered an actual answer: that the stimulus cut taxes selectively, while Romney and Ryan would cut taxes across the board. “The stimulus picked and chose winners and losers,” said Beauprez. “And a great portion of it went to green energy, and you know how well that went, just check out Solyndra.” Republicans are indeed obsessed with Solyndra. But the entire energy allocation in the stimulus was only $15.5 billion, of which $535 million went to Solyndra. Tax cuts acounted for $288 billion of the $840 billion total stimulus package. Beauprez argued that reducing all marginal tax rates and simplifying the tax code by eliminating expenditures would unleash the market, as it did under President Reagan. That’s intuitively appealing. But there is a far more recent example of a president who cut marginal tax rates: George W. Bush. The economy did not respond to that by creating jobs. But as was the case under Reagan, the federal budget deficit increased dramatically. And, of course, none of the speakers specified which tax expenditures would go on the chopping block. As the Tax Policy Center has calculated, Romney cannot fulfill his promise of making his tax cuts revenue neutral without going after the biggest tax expenditures, such as the mortgage interest deduction. That’s a good policy over the long run. But, in the short run, it would mean paying for tax cuts for the wealthy by raising taxes on the middle class. It would also destroy the slowly recovering housing market. Raising taxes on the middle class right now would also undermine the economy by weakening consumer demand. The party that is out of power always has an incentive to pretend that every economic condition is entirely within the president’s power to control. Republicans have been harping on high gas prices, as if it were Obama’s fault. They were notably silent on this subject when prices spiked under President Bush and the GOP Congress in 2006. In point of fact, the federal government does not determine how many jobs there are or how much everything costs. The government sets the amount that every member of society will contribute to the greater good, and what the money will be spent on. Biden was simply stating the objective fact that exogenous forces have made this a hard time for middle-class families, and Romney would take more of their money to fund tax cuts for plutocrats and buy weapons. Obama would do what he can to increase fairness in the tax code and strengthen the social safety net. Just because Obama was elected in 2008 and the economy hasn’t grown by leaps and bounds in the years since does not make any of that untrue or inherently unpersuasive. But Republicans are betting that Americans will be too simple-minded to understand the difference between the economy under Obama and the economic results of his policies. If so, they may see Biden’s comments as an admission that he and Obama have failed and must be replaced. Republicans will surely make the most they can of Biden’s gaffe. Look for Romney to mention it in the debate Wednesday night and on the campaign trail. Don’t be surprised if you see it in a commercial. Republicans have made a long-term strategy of betting on the American people’s inability to grasp the relationship between policies and economic conditions. In 2010 that strategy was vindicated. But sometimes it does not work, and this election feels like it is shaping up to be one such unlucky year for them. For more on the GOP’s flailing, last-ditch attempts to reclaim the election, check out Ben Adler on Romney’s skirting of social issues.